Remarkable Marketable Me: Joining Forces~God gave you a gift of 86,400 seconds today. Have you used one to say "thank you? Joining Forces~God gave you a gift of 86,400 seconds today. Have you used one to say "thank you? Hi Jean Robb here. How can you begin to thank someone for the gift of freedom. It comes at such a cost to the military and their families. I think about all the brave soldiers out there protecting me at this very moment. I also think about the families right now at home wishing that their dad, mom, brother, sister husband or wife could be home safe for the holiday's. It makes me sad to think about how hard it must be on them. It feels like saying thank you is just not enough. What if you could do more? What if you could help one of those families right now? What would you do to show them you appreciate the sacrifice they make every day for your freedom? Here's a great way to get started! 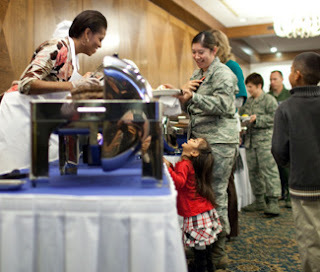 The First Lady and Dr. Biden have met with military families, learned about their successes and challenges, and made it their priority to support them. 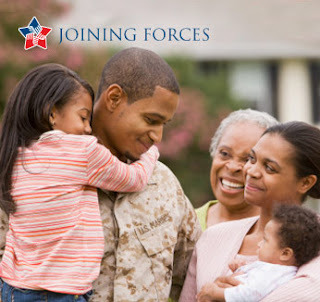 Joining Forces is a comprehensive national initiative to mobilize all sectors of society to give our service members and their families the opportunities and support they have earned. Search for service opportunities by zip code or interest and take action in your community. Powered by allforgood. Pledge service hours in honor of the service military families, veterans and service members. Powered by allforgood. Send a message of support to a military family through a simple web form. Joining Forces is all about coming together to support our nation’s military families. President Obama issued a challenge to the private sector to hire or train 100,000 unemployed veterans and their spouses by the end of 2013. Check out the latest commitments from the business community. 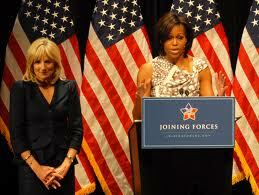 First Lady Michelle Obama and Dr. Jill Biden traveled to St. Louis for Game One of the 2011 World Series to honor the troops, veterans and their families. First Lady Michelle Obama joined the Extreme Makeover: Home Edition team as they built a new home for a 15-year Navy veteran and her family. Steven Spielberg, Tom Hanks and Oprah Winfrey join forces with First Lady Michelle Obama in a public service announcement campaign supporting military families. Explore a map to discovery military presences around the country and learn more about our military families and how you can support them.